EL James and Vintage Books announce that a full length novel of Christian Grey’s perspective of Fifty Shades of Grey—Grey—will be released Thursday, June 18. Get details and pre-order your copy today. One of the best parts of being a Fifty fangirl is that EL James if a fangirl too (just read her Twitter bio)! So, it’s no surprise that she would be sympathetic to our repeated and fervent calls for Christian’s perspective of the events that unfold in the Fifty Shades of Grey saga. Well, EL heard us, and has fulfilled our wishes! Earlier today on social media, she announced that she will release a new version of FSoG from Christian’s point of view titled Grey: Fifty Shades of Grey as Told by Christian. 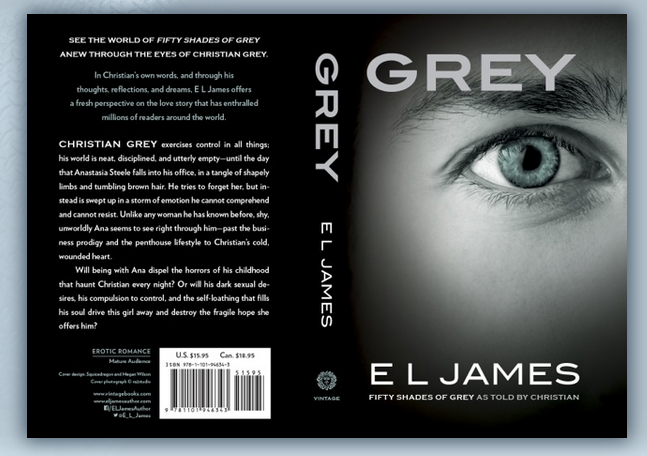 Very appropriately, Grey will be released in a few weeks on June 18, Christian’s birthday. Grey will be available in ebook and paperback formats and you can already pre-order your copy HERE! So, what do you think? I’m always excited about alternative POV stories, and it will be particularly interesting in the case of FSoG. As he sees it, what are the origins of Christian’s dark desire to exercise control in ALL things? How does he come to realize that Ana is the one, and is Christian really as aloof as she perceives? SO MANY QUESTIONS! Check out the cover below and make sure to share your thoughts in comments!